On the 3rd April 2017 PUMA FOOTBALL introduce two spring ready colour updates to the evoPOWER Vigor and evoSPEED SL-S.
•	The evoPOWER Vigor gets a striking Ultra Yellow and Orange colour up to be worn by ‘Scorpion King’ Olivier Giroud and BVB’s Yellow Wall power duo Marc Bartra and Julian Weigl. •	The evoPOWER Vigor increases power and precision with the help of AccuFoam 3D PU dots across the upper and a one-way stretchable ADAP-LITE upper support cage that mimics the motion of barefoot kicking. 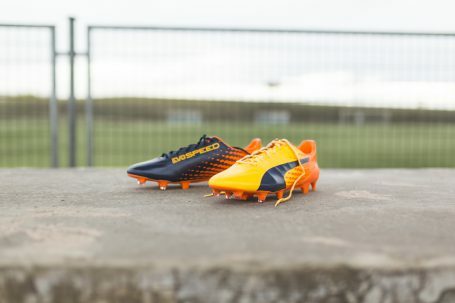 •	The evoSPEED SL-S gets a striking Ultra Yellow and Orange colour up to be worn by ‘The Little Devil’ Antoine Griezmann, Sergio ‘Kun’ Agüero and the world’s fastest defender Héctor Bellerín. •	The evoSPEED SL-S increases acceleration and speed with its super-thin microfiber upper that reduces unnecessary on-pitch weight. The PUMA Football line up will be wearing the new colourway’s on-pitch from the weekend of the 4th of April 2017.